What a wonderful post! There is a magic of appreciation, I think, which is the opposite of the bad-magic of selfishness. There is so much that is lovely and beautiful in the world. In many ways, people are blessed with more “things” than they have had before, and are less appreciative of them. Yet of all “things” the greatest are still the miracles of the created world, the blue sky and the grass, the flowers and the trees and – yes – carrots. Modern Western people are taught to be coarse-mouthed and angry, constantly afraid that they are being cheated out of a little of their hoard or their “rights”, rather than seeing needless and glorious bounty that surrounds them. In other words their culture teaches them to be Jikochuu – the Selfish. My Japanese Okaasan taught us to eat the last grain of rice on our plates. “Nihonjin ha kirei ni taberu” – Japanese people eat cleanly/neatly/beautifully. It is interesting, isn’t it, that “kirei” means all these things. We eat the last grain of rice because it has been given to us and we are thankful for the bounty. We start with Itadakimasu (I humbly receive) and end with Gochisama deshita (It was an honored feast). 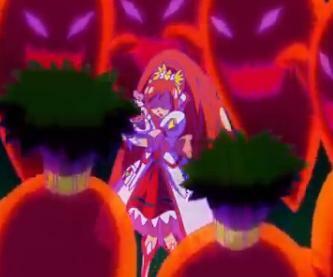 I think it is wonderful that Precure not only reinforces this important aspect of Japanese culture, but also makes clear its underlying significance. Our choice of selfishness or loving gratitude is indeed one little part of the eternal battle between Light and Darkness. Thank you for your kind words about my post, Cure Dolly. 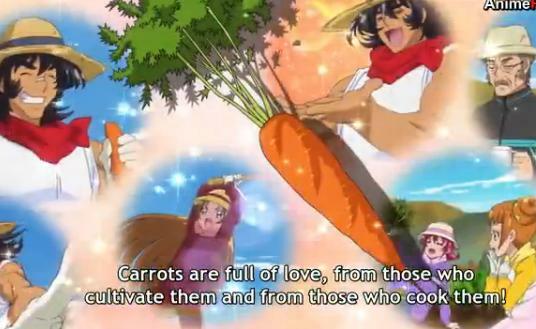 It is interesting, because in the show, there was a carrot farm that seemed to be used to having children who did not like carrots help with growing and picking the carrots to help them to get over their dislike of them. 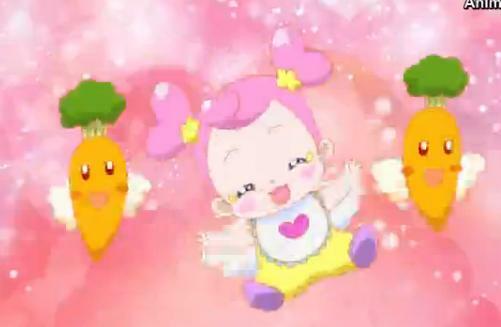 There was another boy there who did not like carrots along with Aguri-chan. That goes along with what you are saying, I think.